Together with our partners in the USA, Australia, UK and Switzerland and the Lockrack Producer in South Africa, we are constantly aiming to satisfy the needs of our customers. Therefore two new Lockrack Sets have been produced and are now available to our customers. The new 35cm Base has been developed to fill the blank between the 25cm Base and the next size up, which was the 45cm Base. A lot of our customers were struggling to choose the right Base for their larger Surfboards and/or Longboards since the 25cm Base was too small and the 45cm Base too large. With the 35cm Base and the small Arms we added another Surfboard/Longboard set to meet the needs of these customers. 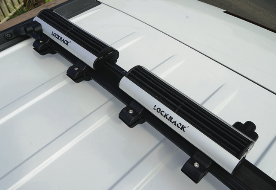 Another addition to the existing Lockrack Sets is the Universal/Extendable Lockrack Set. The Extendable Set is a special and new design that allows one to vary the Base Length between 50cm and 65 cm. 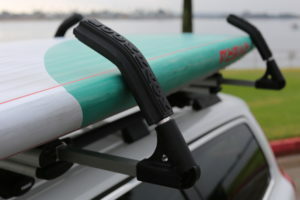 It has been developed in order to multiply the utilisation possibilities, especially for SUP Boards and/or Kayak/Canoes. A lot of our customers have narrower racing boards and wider standard SUP-Boards to use according to weather and water conditions. 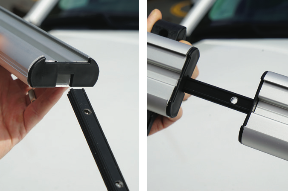 With the Extendable Lockrack Set you can adjust the Base according to your needs. The Universal/Extendable Base consists of two small Bases that are held together with an adjustable connector. With this connector, the Length of the Base can be alternated between 50cm and 65cm. In order to do so, the two Base-Parts have to be reassembled. You find more information about the installation on our Universal/Extendable Leaflet. With all the different Bases/Arms and the possibilities to combine them, one can easily loose track of which Lockrack-Set would be best for which Watercraft. We would therefore like to emphazise that we are happy to give you advice and recommendations based on our experience and contact with partners and the producer. Please do not hesitate to contact us in order to find out more about the product, choose the right Lockrack and satisfy your demands. We speak German, English, French, Italian and Spanish.